The kind of segment this array element describes or how to interpret the array element's information. Type values and their meanings are specified in Table 7-25. Flags that are relevant to the segment. Type values and their meanings are specified in Table 7-26. This segment contains the stack unwind table. PT_SUNW_EH_FRAME is equivalent to PT_SUNW_EH_UNWIND. Specifies capability requirements. See Capabilities Section for details. Note - Unless specifically required elsewhere, all program header segment types are optional. 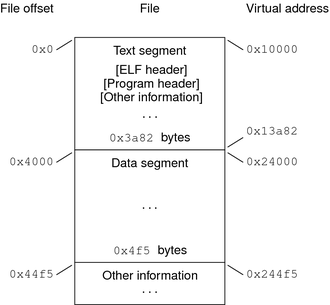 A file's program header table can contain only those elements that are relevant to its contents. Text segments contain read-only instructions and data. Data segments contain writable-data and instructions. See Table 7-10 for a list of all special sections. Note - The previous examples reflect typical Oracle Solaris OS binaries that have their text segments rounded. In the Oracle Solaris OS, the interpreter is known as the runtime linker, ld.so.1(1). In general, the value of each dynamic tag determines the interpretation of the d_un union. This convention provides for simpler interpretation of dynamic tags by third party tools. A tag whose value is an even number indicates a dynamic section entry that uses d_ptr. A tag whose value is an odd number indicates a dynamic section entry that uses d_val, or that the tag uses neither d_ptr nor d_val. Tags with values in the following special compatibility ranges do not follow these rules. Third party tools must handle these exception ranges explicitly on an item by item basis. Tags whose values are less than the special value DT_ENCODING. Tags with values that fall between DT_LOOS and DT_SUNW_ENCODING. Tags with values that fall between DT_HIOS and DT_LOPROC. Various state flags which are applied to the DT_ element immediately following. See Table 7-35. Flag values specific to this object. See Table 7-33. The address of the capabilities section. See Capabilities Section. The address of the symbol table containing local function symbols that augment the symbols provided by DT_SYMTAB. These symbols are always adjacent to, and immediately precede the symbols provided by DT_SYMTAB. See Symbol Table Section. 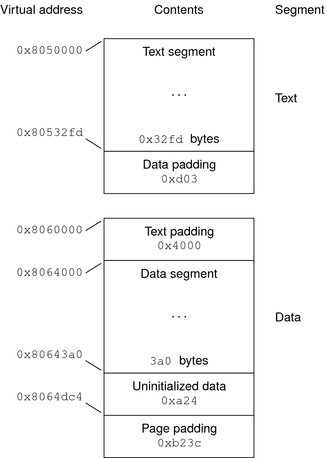 The combined size of the symbol tables given by DT_SUNW_SYMTAB and DT_SYMTAB. Dynamic tag values that are greater than or equal to DT_SUNW_ENCODING, and less than or equal to DT_HIOS, follow the rules for the interpretation of the d_un union. The size, in bytes, of the DT_SUNW_SYMSORT and DT_SUNW_TLSSORT symbol sort entries. The address of the array of symbol table indices that provide sorted access to function and variable symbols in the symbol table referenced by DT_SUNW_SYMTAB. See Symbol Sort Sections. The total size, in bytes, of the DT_SUNW_SYMSORT array. The address of the array of symbol table indices that provide sorted access to thread local symbols in the symbol table referenced by DT_SUNW_SYMTAB. See Symbol Sort Sections. The total size, in bytes, of the DT_SUNW_TLSSORT array. The address of the array of symbol table indices that provide the association of symbols to their capability requirements. See Capabilities Section. The total size, in bytes, of the unused reserved space at the end of the dynamic string table. If DT_SUNW_STRPAD is not present in an object, no reserved space is available. The address of the array of capability family indices. Each family of indices is terminated with a 0 entry. The machine architecture of the link-editor that produced the object. DT_SUNW_LDMACH uses the same EM_ integer values used for the e_machine field of the ELF header. See ELF Header. DT_SUNW_LDMACH is used to identify the class, 32–bit or 64–bit, and the platform of the link-editor that built the object. This information is not used by the runtime linker, but exists purely for documentation. The size, in bytes, of the DT_SUNW_CAPCHAIN entries. The total size, in bytes, or the DT_SUNW_CAPCHAIN chain. Flag values specific to this object. See Table 7-34. Object has been modified since originally built. Indicates that the object should use direct binding information. See Appendix D, Direct Bindings. Indicates that this object contains symbols that can not be directly bound to. See SYMBOL_SCOPE / SYMBOL_VERSION Directives. Indicates that this object has been edited or has been modified since the objects original construction by the link-editor. This flag serves as a warning to debuggers that an object might have had an arbitrary change made since the object was originally built. Indicates that the object contains individual symbols that should interpose before all symbols except the primary load object, which is typically the executable. This flag is recorded when the object is built using a mapfile and the INTERPOSE keyword. See SYMBOL_SCOPE / SYMBOL_VERSION Directives. Indicates that the object defines, or makes reference to singleton symbols. See SYMBOL_SCOPE / SYMBOL_VERSION Directives. The first four procedure linkage table entries are reserved. The original contents of these entries are unspecified, despite the example that is shown in Table 7-36. Each entry in the table occupies 3 words (12 bytes), and the last table entry is followed by a nop instruction. To illustrate procedure linkage tables, Table 7-36 shows four entries. Two of the four are initial reserved entries. The third entry is a call to name101. The fourth entry is a call to name102. The example assumes that the entry for name102 is the table's last entry. A nop instruction follows this last entry. The left column shows the instructions from the object file before dynamic linking. The right column illustrates a possible instruction sequence that the runtime linker might use to fix the procedure linkage table entries. Note - The different instruction sequences that are shown for .PLT101, and .PLT102 demonstrate how the update can be optimized for the associated destination. The first four procedure linkage table entries are reserved. The original contents of these entries are unspecified, despite the example that is shown in Table 7-37. Each of the first 32,768 entries in the table occupies 8 words (32 bytes), and must be aligned on a 32–byte boundary. The table as a whole must be aligned on a 256–byte boundary. If more than 32,768 entries are required, the remaining entries consist of 6 words (24 bytes) and 1 pointer (8 bytes). The instructions are collected together in blocks of 160 entries followed by 160 pointers. The last group of entries and pointers can contain less than 160 items. No padding is required. Note - The numbers 32,768 and 160 are based on the limits of branch and load displacements respectively with the second rounded down to make the divisions between code and data fall on 256–byte boundaries so as to improve cache performance. To illustrate procedure linkage tables, Table 7-37 shows several entries. The first three show initial reserved entries. The following three show examples of the initial 32,768 entries together with possible resolved forms that might apply if the target address was +/- 2 Gbytes of the entry, within the lower 4 Gbytes of the address space, or anywhere respectively. The final two show examples of later entries, which consist of instruction and pointer pairs. The left column shows the instructions from the object file before dynamic linking. The right column demonstrates a possible instruction sequence that the runtime linker might use to fix the procedure linkage table entries. Note - The different instruction sequences that are shown for .PLT101, .PLT102, and .PLT103 demonstrate how the update can be optimized for the associated destination. Note - As the preceding examples show, the procedure linkage table instructions use different operand addressing modes for absolute code and for position-independent code. Nonetheless, their interfaces to the runtime linker are the same.